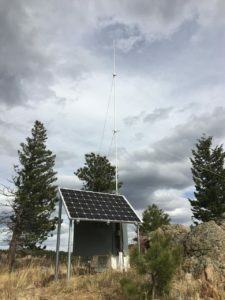 AirLink is a group of licensed amateur (“ham”) radio operators located in western Boulder County, Colorado, that is focused on supporting our mountain communities by providing communications in times of need. This is especially critical when telephone service is lost. “About” describes our mission and history, as well as our community members and county affiliations. “Becoming Licensed” contains detailed info if you’re new to ham radio and want to find out about getting a license. 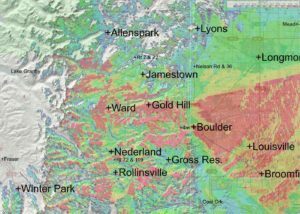 “Are You Prepared?” provides important information about being prepared for the disruptions and disasters that can happen if you live in the mountains. “Member Info” provides resources if you’re already a member of the AirLink Network; links include important documents to be used during our weekly Net. “Scrapbook” provides text and photos about the three evacuations some group members experienced (two for wildfires, and one for the 2013 flood) that were the impetus for forming the AirLink Group. “Contact” provides information about the various ways you can contact us with any questions or suggestions you may have, including contacting us by radio! And please consider making a donation—click the green Donate Now button in the sidebar at the right of every page in this website. We’re a non-profit consisting of a group of dedicated volunteers. Your donation can help keep us providing emergency communications for mountain communities. In the meantime, the following is a photo of us, a photo of the foundation of the AirLink Network—our repeater, and a graphic that illustrates our far-reaching coverage area . . . The AirLink Amateur Radio Group (affectionately referred to as “AARG”) who founded, designed, installed, and use the AirLink Network. The AirLink Repeater lives on top of Horsfall, the hill rising to the east above the town of Gold Hill. A repeater receives a weak amateur radio signal and retransmits it at a higher level or power, so the signal can cover longer distances without degrading. This is a map of AirLink’s radio coverage as of September, 2014. Red is excellent coverage, green is good, and white indicates no coverage at all. 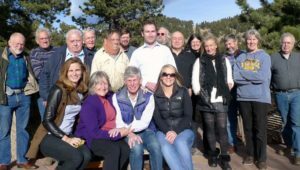 The network was expanded in 2017 (thanks to a Foothills United Way grant) to include the Town of Jamestown—the only local mountain town not included due to topography constraints.